UFC featherweight champion Conor McGregor has always been one to speak his mind. The brash Irishman, who will challenge Eddie Alvarez for the UFC’s lightweight title on November 12 in New York, recently did a Fan Q&A with the LAD Bible where he gave his take on Alvarez as an opponent. Conor further elaborated on why he believes Eddie Alvarez will be an “easy” opponent. 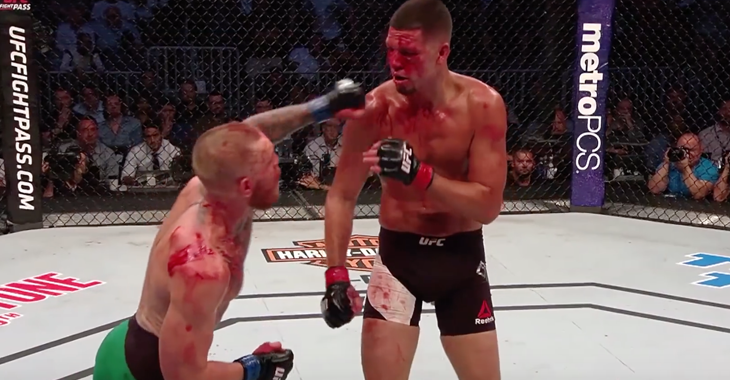 Conor McGregor was last seen in action at August’s UFC 202 event where he scored a majority decision victory over rival Nate Diaz in a bout that was deemed “fight of the night” and a possible “fight of the year” candidate. The Irish superstar has gone 8-1 in his UFC career, scoring finishes in six of those eight wins. Meanwhile, Eddie Alarez captured the UFC lightweight title by scoring a first-round knockout victory over Rafael dos Anjos this past July in Las Vegas. Prior to that, Alvarez had scored split-decision victories over Anthony Pettis and Gilbert Melendez respectively. Who do you think will emerge victorious in the main event of UFC 205, McGregor or Alvarez? Jarjis Danho vs. Daniel Omielanczuk – Omielanczuk wins a majority decision withs cores of 29-29, and 29-28 (twice). Martin Svensson vs. David Teymur – Teymur wins by TKO (ground strikes) at 1:26 of the second round. Marshawn Lynch announces NFL retirement! While everyone was expecting Peyton Manning to make retirement headlines following his victory at Super Bowl 50, it was Seahawks running back Marshawn Lynch who stole the headlines. “Beast Mode” took to twitter Sunday night where he simply tweeted a peace emoji and a picture of his cleats suspended from a telephone wire. Although Lynch made no official statement on the matter, his agent and Seahawks owner Paul Allen acknowledged his departure from the game on Monday. Lynch won a Super Bowl with the Seahawks 3 years ago when the squad demolished this year’s Super Bowl champion the Denver Broncos. Lynch will go down in history as one of the toughest and most durable backs in NFL history. During his nine-year NFL career, Lynch accumulated 9,112 yards rushing to go along with 74 touchdown scores.